A man in a business suit offers the protection of his umbrella to an unsuspecting woman ... and several days later she turns up dead on a river bank. The terrifying serial killer known in the press as the Rainy Day Killer is now hunting new victims in the city of Glendale ... whenever it rains. Homicide Lieutenant Hank Donaghue leads the investigation , assisted by FBI profiler Ed Griffin and Detective Karen Stainer, as they pursue an elusive predator who leaves no physical evidence behind. The timing couldn't be worse, however, as Karen Stainer's attention is divided between the investigation and preparations for her upcoming wedding in Virginia. Will her one chance at a personal life end in another gruesome murder, or will she survive to say her vows? 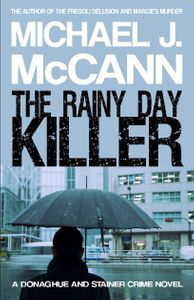 Ask your local independent bookstore to order THE RAINY DAY KILLER in paperback for you. It's available world-wide through the Ingram catalog.